A great experience is only partially made by great food and drinks. Of equal importance is the environment and the customer service. 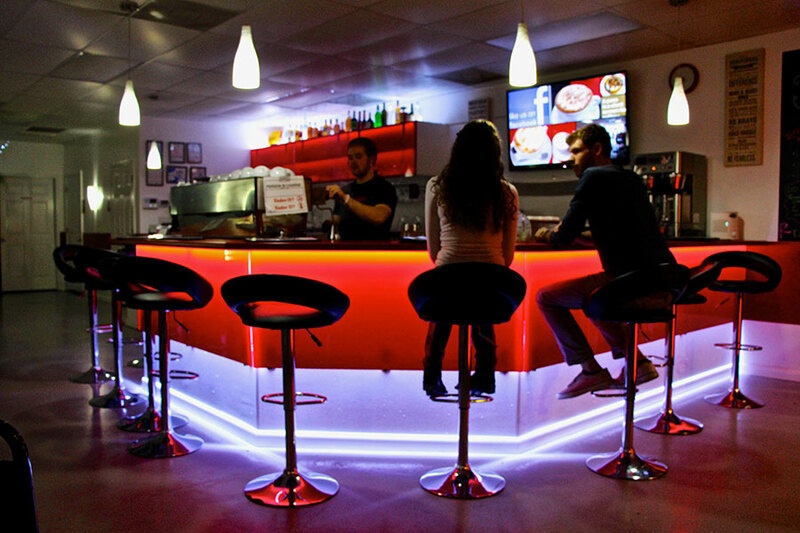 When designing REDBAR there was particular emphasis on creating an engaging and social environment. Typical coffee shops are typical. Browns and greens, antiques and fraternity house couches. Why does every coffee shop look the same? We wanted to create an environment as lively as coffee is used to arouse. Bright whites and reds wake up your senses. The wrap around bar around the espresso machine invites you to participate in the barista experience. In an increasingly disconnected world the bar concept is still effective in opening conversation. Then when the sun sets REDBAR takes on a whole new life. Backlit bars, great sound systems, and a drink menu featuring more organic spirits than you likely knew were available. We take the coffee experience to a different level with some of the best espresso based mixed drinks you’ve ever had. Add in organic wines, high quality and organic beers, and you’ve got a fun night waiting for you and your friends. Of course we always promote responsibility, so take it slow and enjoy. When it comes to customer service we are always training, always moving our employees to maintain integrity and an awareness of our customers needs. We hope your next visit makes you feel like you are loved as much as we love coffee.